This post is sponsored by Apartment Guide. 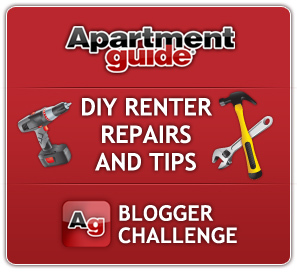 Remember a week or so ago when I mentioned that I was involved in Apartment Guide's DIY Renter Repairs and Tips Bloggers Challenge? Well, today I have a few great tips for you on how to make a rental into a home - and a giveaway from Apartment Guide as well! I have been on both ends of the spectrum. I have been a renter and I have been a home owner. Currently, we are renting the home we live in. And although home ownership allows you certain freedoms to make changes that renting doesn't allow, my belief is that it is important to make ANY PLACE that you live into a comfortable home. After all, your home is your haven, your escape from the world, and it should be an inviting to place to come home to, it should be a retreat! That said, here a few easy, cost-effective tips for making a rental home your own - all of which are reversible when the time comes for you to move out. 1. Paint. Okay, I can hear a collective groan. I realize that not all rental contracts allow for painting and I'll give you some alternatives in a minute. But if your contract allows it - and don't be afraid to ask, the worst they can do is say "no" - painting is a super quick and easy way to make a space your own. 2. Gift Wrap Your Walls. No, I don't mean putting up wallpaper. But if you have a fairly small wall space to cover, using a staple gun to attach gift wrap or even fabric to a wall can go a long way toward personalizing a space. You can read about how I did this here. 3. Use adhesive vinyl. In my last rental house, I wanted a chalkboard wall in the worst way...but we weren't allowed to paint. So I purchased a few rolls of adhesive vinyl chalkboard and put it up on the wall. I got my chalkboard and when we moved, it came off clean as a whistle. 4. Personalize your Lighting. One way to accomplish this is to change out the light fixtures. This is only as expensive as purchasing the light fixture you want - and possibly hiring an electrician to do the job if you don't know how (I don't want anyone electrocuting themselves). And you can replace the old light fixtures when you move. 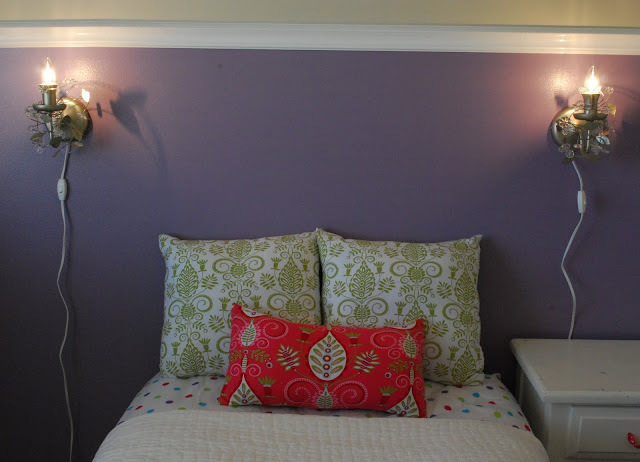 Another way to do this is to add wall sconces. They don't require hard wiring but can add loads of personality. And I just want you to know that I am well aware that the cords look TERRIBLE in the photo I am showing you from the Princess' new bedroom...but we are repainting the entire room, so I haven't put up the cord casings yet - and they will be against a white wall anyway which will minimize the look. Just sayin'. 5. Add Curtains. This might seem like a no brainer to some of you. But, I also know that a lot of people hesitate to put tons of effort into decorating a place that is not "theirs". Let me just say that the fact that you don't own a place, doesn't mean that it's not "yours". You live there. Having a place that is pleasant and attractive to live is an investment in yourself. So check out this before and after. 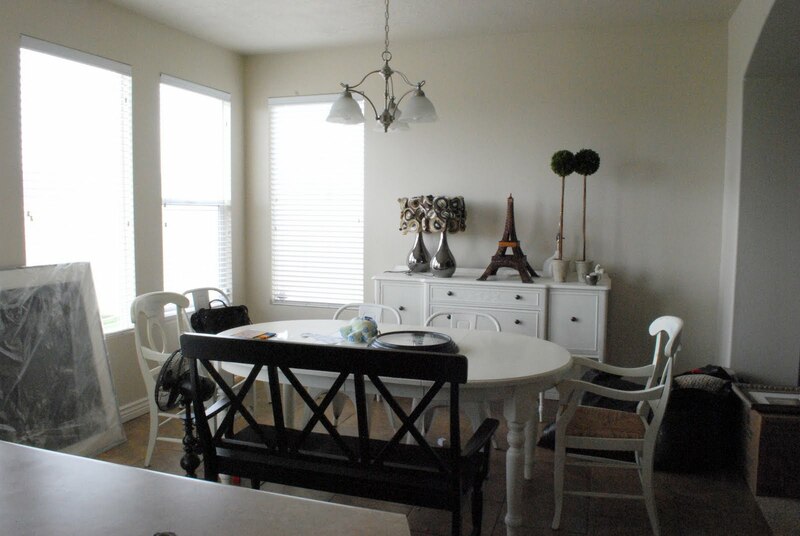 Here is my dining room without curtains. It's a pretty room (and undecorated and messy, sorry). But it lacks the feeling of being finished. Here it is with the addition of curtains. WOW! What a difference. It's still not technically finished being decorated, but those curtains go a long way toward making it feel like "home". Not to mention the fact that they offer some needed - albeit faux - architectural interest. So, my dear readers, whether you rent or own is not the point. It's the thought and effort that you put into making a space your own that really matters. I hope that these tips help to get you thinking about the different ways that you can make any space that you live in your own. 1. Follow Apartment Guide on Twitter then come back and leave me a comment. 2. Like Apartment Guide on Facebook then come back and leave me a comment. 3. Mention this giveaway on your blog, twitter, or facebook... please leave a separate comment for each thing you do. And thank you to Apartment Guide for inviting me to take part in this Blogger's Challenge. Whether you’re living, looking or moving, Apartment Guide will help point you in the right direction. Apartment Guide has tips on how to update and make repairs at home whether you are in a large or small space. It’s helpful information no matter where you live. Apartment Guide is owned by Consumer Source, Inc. Apartment Guide partnered with bloggers such as me to participate in its “DIY Renter Repairs and Tips” Blogger Challenge. As part of that program, I received compensation. They did not tell me what to purchase or what to say about the products used for the “DIY Renter Repairs and Tips” Blogger Challenge. Apartment Guide and Consumer Source believe that consumers and bloggers are free to form their own opinions and share them in their own words. Consumer Source’s policies align with WOMMA Ethics Code, FTC guidelines and social media engagement recommendations. Oh my goodney gracious! This is awesome... I like them on facebook! it is at the bottom of the page! I now have followed them on Twitter..thanks for the chance!! I follow AG on Twitter @TheNestEffect. I like AG on FB. I follow AG on twitter! I like AG on facebook! Already followed them on Facebook. Love your tips, especially the photo of your little girl's room. Your ideas have helped me so much in our big Reno here. How awesome! I'm in the middle of redecorating our living space and could totally use this! I'm now following Apartment Guide on twitter. Thanks for this chance and for the awesome tips. We're renting right now and have had a difficult time making this space "ours." Oooooh Wend, I am lovin the curtains!!!! They really look good!My curtains (on the other hand) are giving me a great deal of stress. oii! 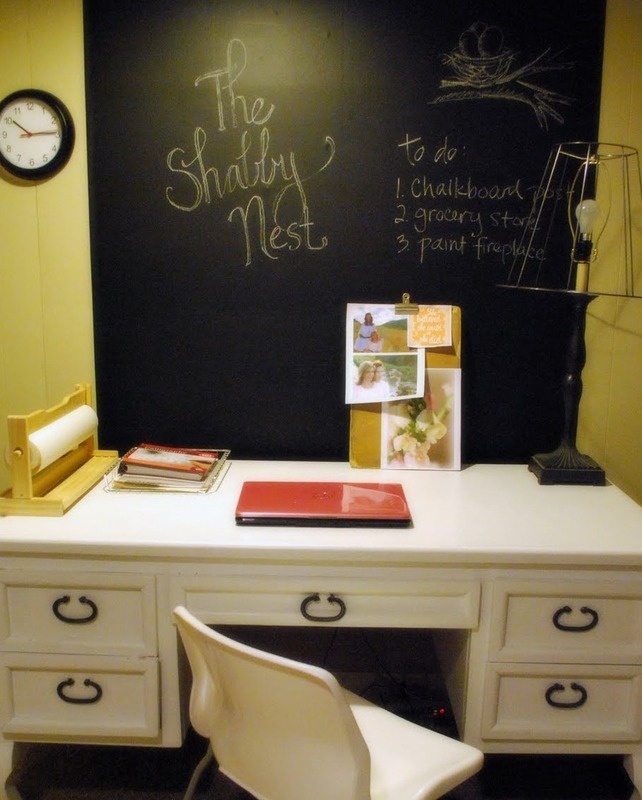 what a great idea with the vinyl chalkboard. i would never have even thought about that! These are such great tips! I'll keep this in mind for the future, should we ever rent! Curtains absolutely make your dining room!! I am following Apartment Guide on Twitter. I am a fan of Apartment Guide on Facebook too! Just liked Apartment Guide on FB. Great advice-- followed AG on Twitter! Maybe I'll try the fabric on the wall-- "liked" on Facebook! I "liked" AG on Facebook. The gift card would come in handy to further spruce up the space! Oh, I love love love this! I just moved into my first big-girl apartment and am trying to find my decorating style! Thanks for this great ideas that will help make my apartment cozier! I liked Apartment Guide on Facebook and am looking forward to many more great tips! Every since finding your blog (by accident) I have transformed my house into DYI bliss. I saw your photo of your Princess' room and I love the wall scones. I was wondering where you purchased them? I'm finding it difficult to find nice wall scones for our bedroom. Thanks so much for all your inspiration!! I actually got them at IKEA. They're a super deal..and so pretty!